On Day 3 of Copperstate at the Buckeye Air Fair, crowds were again strong and the skies gradually cleared for another day of flying in the smoothest air I’ve felt in some time. What made this extra special was a chance to go aloft in the Flying Legend Tucano Replica, a scaled down version of a well-known Brazilian military aircraft. Indeed, the fighter-like shape and paint job of Tucano beckoned convincingly and I went aloft with Flying Legend USA representative, Giovanni Matichecchia …yeah, I told him I’d just call him Giovanni. He grinned and said his last name was tough even for Italians. This capable 27-year-old pilot is off to the airlines one day but is doing a fine job of demonstration flying Tucano for media types like me and potential buyers of this eye-catching machine. 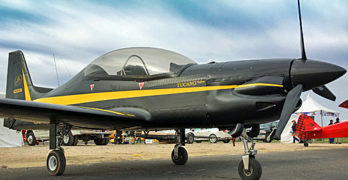 Flying Legend’s Tucano is a scale replica of well-regarded original.